James Allen Nussle (born June 27, 1960) is the president and chief executive officer of the Credit Union National Association. He is a former American politician. Nussle served as a member of the United States House of Representatives from 1991 to 2007, was the Republican nominee for the 2006 Iowa gubernatorial election, losing to Democrat Chet Culver and was the director of the Office of Management and Budget from 2007 to 2009. Nussle was born in Des Moines, Iowa. After high school, Nussle studied in Denmark (his political action committee (PAC) was at one time called "Great Dane PAC" and he is of Danish descent). He then received a B.A. in international studies, political science, and economics from Luther College in 1983, and a J.D. degree from Drake University in Des Moines in 1985. While at Luther he was a member of the Zeta Rho Tau fraternity and was the lead singer in a band called ZPT blues band. Nussle also founded the Luther College Republicans chapter during his time at Luther. Upon graduation from Drake University law school, Nussle took his first step in becoming a public servant when he was elected as the Delaware County, Iowa attorney in Manchester. While in Manchester, Nussle became a volunteer firefighter. Currently he is the president and CEO of the Credit Union National Association. When the incumbent six-term Republican in what was then the 2nd District, Tom Tauke made an unsuccessful run against Senator Tom Harkin during the 1990 election, Nussle ran as the Republican candidate for Tauke's House seat. Nussle's first election to the House was the closest election for him during his entire tenure in the House. He and challenger Eric Tabor had been in a virtual dead heat in the time leading up to the election. Just before the election, Tabor became embroiled in a controversy regarding absentee ballots that family members had cast. This controversy caused some votes to not be counted at the end, and also cost Tabor other votes as well. Ultimately, Nussle won by 1,600 votes. Tabor did not concede the election to Nussle until the day after the election. In 1992, as a result of redistricting, Nussle's district was merged with the 3rd District of Democrat Dave Nagle. This was because Iowa's House delegation was being reduced from six down to five Representatives. The merged district was more Nussle's district than Nagle's, which worked to Nussle's advantage even though he had only one term to Nagle's three. Nussle won reelection by 2,900 votes. Nussle's first exposure to national attention came when he made a speech from the well of the House while wearing a paper bag over his head to protest the "shameful" ethical behavior involved in the House banking scandal. It remains a trademark reminder of Nussle. He became chairman of the House Budget Committee in 2001, the first Iowan to serve as chair of this committee. His position brought national and international interest to his district, including the ONE Campaign, the lobbying group formed by Bono of the rock band U2. The group has targeted Nussle's district with billboard and radio ads. On March 23, 2006 they placed a statement in Nussle's article on English Wikipedia, regarding poverty in Africa and Nussle's budget influence, hoping to influence Nussle. (The statement was quickly removed by editors as it violated English Wikipedia policies on maintaining a neutral point of view). On March 24, 2006 the Des Moines Register contained a story[permanent dead link] about this revision in which ONE confirmed that they had placed the statement. Nussle's voting record was relatively conservative, despite representing a district with a slight Democratic lean. He had a lifetime rating of 85 from the American Conservative Union. His district has voted for the Democratic presidential candidate in every election since 1988. Typical conservative positions Nussle embraced are supporting restrictions on abortion and supporting President Bush's tax cuts. His district was renumbered as the 1st District as a result of the 2000s (decade) round of redistricting, and became even more Democratic with the addition of much of Iowa's share of the Quad Cities. However, Nussle was reelected handily in 2002 and 2004. When Iowa Governor Tom Vilsack announced that he would not seek a third term as governor in 2006, a number of people from both parties began exploring running for governor. That included Nussle, who began considering a run shortly after Vilsack made his announcement. On June 2, 2005; Nussle announced he would run for governor. His only serious primary challenger, Bob Vander Plaats, withdrew from the race to endorse Nussle and become his running mate. On February 21, 2006, the Iowa Democratic Party filed an ethics complaint against Nussle for not reporting any in-kind donations from the federal "Nussle for Congress Committee". On July 12, 2006, the Iowa Ethics and Campaign Disclosure Board unanimously voted to close the investigation with a finding of no probable cause to believe that a violation of a statute or rule under the board's jurisdiction occurred. On June 6, 2006, Nussle won the Republican primary, but lost the general election to Iowa Secretary of State Chet Culver on November 7 by a wide margin. He even lost his own congressional district. Since the defeat, he first started his own consulting business and then was nominated to become the director of the Office of Management and Budget under President Bush. Three Republicans and four Democrats announced their intentions to seek the House seat Nussle was vacating in January, 2007. The primaries pared the candidates down to Democrat Bruce Braley and Republican Mike Whalen. Braley won Nussle's former seat. Nussle was nominated by George W. Bush to replace Rob Portman as OMB Director, and was sworn in on September 10, 2007. A March 9, 2005 quote of Nussle's was included in the 2006 World Almanac and Book of Facts's list of notable quotes in 2005 (p. 39): "Everyone wants to get to heaven, but no one wants to die." According to the almanac, the quote refers to opposition to his proposed budget, which included cuts to several earmarks and programs; the statement was made during Nussle's tenure as House Budget Committee chairman. 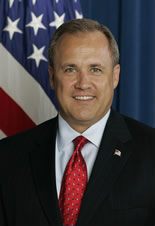 After leaving the Bush Administration in January 2009, Nussle founded The Nussle Group, a media and strategic consulting firm. In November 2010, Nussle became president and COO of Growth Energy. In September 2014, it was announced that he would become the president and chief executive officer of the Credit Union National Association, a trade group for credit unions. ^ E. Michael Myers (2007-09-10). "Nussle sworn in as budget chief". Retrieved 2008-10-26. ^ Raab, Marian (September 9, 2014). "CUNA Picks Former Congressman As New Chief Executive". Credit Union Journal. Retrieved September 9, 2014. This page was last edited on 20 October 2018, at 15:44 (UTC).